One person is reported dead and Russia’s only aircraft carrier has been damaged as floating dry dock sinks into the waters of the Kola Bay. 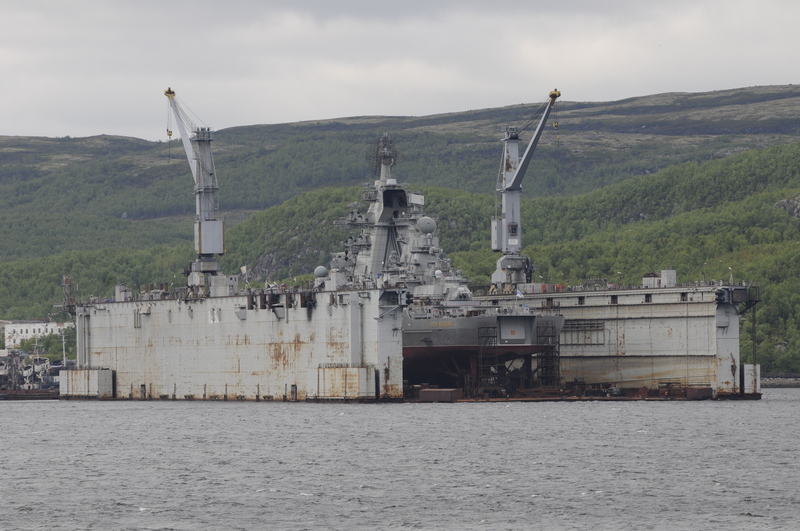 It was early morning Tuesday in Roslyakovo, near Murmansk, when Russia’s biggest floating dry dock experienced serious technical problems reportedly triggered by a power outage. The accident started as aircraft carrier «Admiral Kuznetsov» was to be taken out of the dock and into the nearby waters, Interfax reports. The vessel was damaged as a large crane fell over the ship deck, sources tell the news agency. There has not come any official comments from Zvezdochka, the company that operates yard No 82 in Roslyakovo. However, regional Governor Marina Kovtun has issued a video report about the incident. The aircraft carrier has now been towed to the nearby Sevmorput Yard No 35, yard press spokesman Yevgeny Gladyshev told Interfax. He makes clear that the power outage was what caused the accident. There has in recent days been several cases of power outage all over the region, including in the cities of Severomorsk and Murmansk. In addition, the dry dock has itself had repeated problems with its aging technical equipment, including the electricity system. The floating dry dock at the Yard No 82 in Roslyakovo is Russia’s biggest and the only place where the Northern Fleet can conduct repairs and upgrades of its largest ships like the «Admiral Kuznetsov» as well as battle cruiser «Pyotr Veliky». The 330 meter long dock was built in Sweden in 1980 and few years later bought by the Soviet Union and taken to the Kola Bay. There were about 60 people on the dock when it started to sink. Five of them did not manage to get in safety. One is reported dead and four injured, one with a serious condition. Regional prosecutors only few hours after the accident confirmed that they would initiate a criminal case against people involved in the incident, Interfax reports. Russia’s only aircraft carrier, the «Admiral Kuznetsov» has since last fall been docked in the yard in Roslyakovo where it is undergoing major upgrades. The works include both navigation equipment and weaponry. All the ship’s electro-mechanical components, including the main propulsion system, will be repaired. Several of the engine-boilers will be replaces and the runway will be upgraded. Launched in 1990, the 305 meters aircraft carrier is Russia’s largest warship. Last major overhaul was made between 1996 and 1998.